The main purpose of PCCIJ is to develop and advance the relationship of Philippine and Japan through international trade and investments. 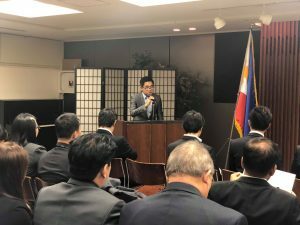 Also we support members with the information that suits thier needs regarding trade,financial resources, and industry and work as a bridge for boosting mutual understanding and partnership between the two countries, and aim to encourage the cultural exchange between Philippine and Japan. Agenda:　Activities in 2018, Financial Results of 2018, Report by Auditor, Election of New Board members, Business Plan for 2019, Budget Proposal for 2019. All the members are kindly requested to let us know the attendees’ name as well as your company name by e-mail. Last February 21, the PCCIJ, with the help of DTI Tokyo Ms. Dita Angara Mathay, hosted the networking event with the South Luzon Chapter of the Philippine Chamber of Commerce (PCCI). The event was held at the Philippine Embassy Siazon Hall. 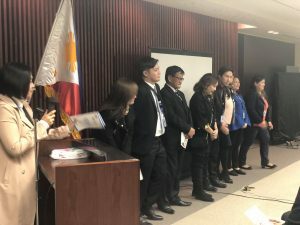 More than 50 corporate members of PCCI South Luzon led by PCCI Vice President Teresita M. Leabres attended the event with about 35 corporate members and guests joining from the PCCIJ. The event was an outstanding success and PCCIJ hopes to hold similar events in the future. PCCIJ Chairman Allan Reyes delivering the opening speech to welcome the PCCI South Luzon delegation. PCCI South Luzon Vice President Teresita M. Leabres delivering her speech. 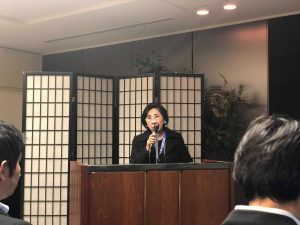 The Philippine Chamber of Commerce and Industry in Japan will hold its annual Christmas party on Wednesday, December 12, 2018. PCCIJ welcomes members and guests to join us in this celebration. (4) The participation fee will be collected at the reception desk on the same day so please prepare the exact amount. (5) The members who have not paid this year’s annual membership fee are kindly requested to pay it at the reception. Otherwise such members could be considered as non-members. For those who wish to participate, please provide your company name and the name of the participants to the Philippine Chamber of Commerce (pccijsec@gmail.com). 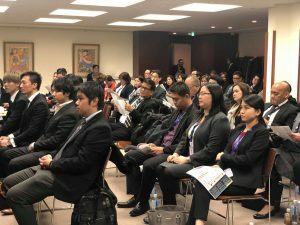 We will be holding a seminar on July 23, 2018 on the topic “The Philippines’ Overseas Employment Policy and Its Perspective Including the current situation and the issues to be resolved in Japan”. 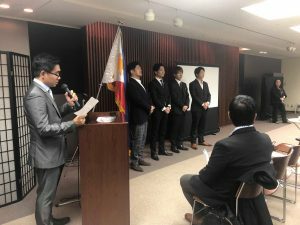 The seminar will be a lecture about the overseas Filipino workers to be given by a senior official of Philippine Embassy in Japan. The attendants are kindly requested to inform and register “your name” and “company name” in advance to the office of PCCIJ by e-mail. Please note that this time the social gathering with light meal will not to be held. Please email the secretariat (pccijsec@gmail.com) to confirm your attendance. Agenda:　Activities in 2017, Financial Results of 2017, Report by Auditor, Election of New Board members, Business Plan for 2018, Budget Proposal for 2018. All the members are kindly requested to let us know the attendees’ name as well as your company name by e-mail on or before March 7, Wed. 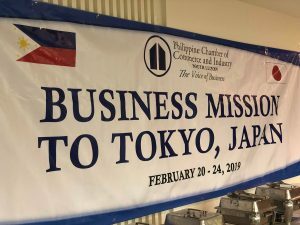 The Philippine Chamber of Commerce and Industry in Japan will hold its annual Christmas party on Wednesday, December 20, 2017. The participation fee will be collected at the reception desk on the same day so please prepare the exact amount. We will be holding a seminar on September 20 on the topic “”Update on Economic Opportunities in the Philippines”. Please note that this seminar will be held at the Commerce and Trade Office of the Philippine Embassy located in the same building as the Philippine National Bank, Tokyo Branch Office. 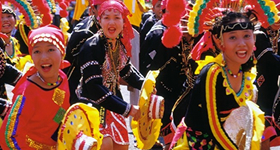 Pre-registration is a must as this is an event at the Embassy’s Commerce and Trade Office. Free for all the employees of the corporate members and individual members. Please note that there will be no party and refreshments will not be served at the end of the seminar. Please note that you may be refused entry if you do not register your attendance. We will be holding a seminar on May 17, 2017 on the topic “”Current Situation of the Philippine economy and the Trends of Japanese Companies in the Philippines”. We invite both members and non members to join the seminar. Light food and drinks will be served after the seminar. Please email the secretariat (pccijsec@gmail.com) by May 12 to confirm your attendance. Please note that you may be refused entry at the embassy entrance if you do not register your attendance. *Refreshments will be served after the meeting.